Axel came in over the weekend for his big photography debut and newborn session. He had some of the best little round cheeks I've ever seen, and I loved his full head of hair that seemed to already match his big brother's haircut. 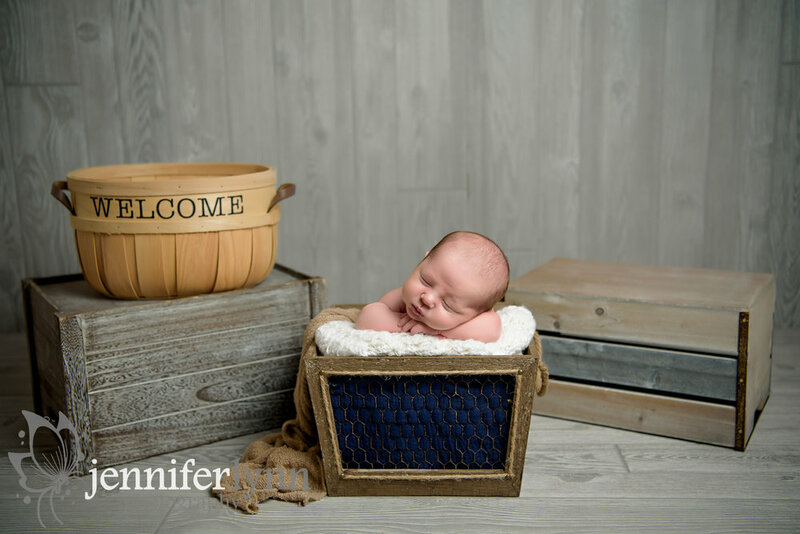 He was a great little sleeper, and seemed to really love being on his back versus his tummy, but I was able to get a great mix of both for his complete newborn gallery. His big brother also did great, despite all the new things and big lights in the studio. There are several adorable photos of the two brothers together with the moon prop that I can't wait to show his parents, although I included one below as a fun sneak peek. Being in a new environment can really put kids out of their element and comfort zone, especially with a stranger asking them to sit and smile, but this little guy did great! Axel also started to stir toward the end, so instead of fighting it and trying to get more bean bag photos with a second blanket, I put in him in my big round basket and let him wake up and look around. He peacefully looked around and gazed at my clicking camera, and I love how I was able to capture some of him awake and alert. Those are always special since newborns truly sleep almost all the time! A big congrats to this family on your new little one! And thanks for letting me preserve these special memories of your now family of four.